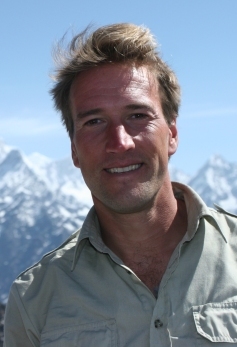 Ben Fogle became famous as the star of television's first attempt at reality TV, Castaway, in 2000. Since then the TV star, author and adventurer has taken part in many of the toughest physical challenges on Earth, such as the 180-mile Marathon des Sables in the Sahara and a 100-mile ice-skating marathon across Sweden, rowing across the Atlantic and walking to the South Pole. Most recently he has been in Augusta, Western Australia taking part in the Anaconda Adventure Race series filiming for his new programme "Year of Adventures'. He has presented numerous shows including BBC's Animal Park, Wild In Africa, Countryfile, Crufts, One Man and His Dog and Extreme Dreams. He is also a correspondent for NBC in the US. He writes regularly for the UK Sunday Telegraph and the Independent and has written five bestselling books. His latest book, The Accidental Adventurer is out now. Travel for you clearly doesn't mean a week in sunny Benidorm - where did the thirst for adventure come from? I'm not really sure. The title of my new travel memoir is The Accidental Adventurer, and that sort of sums me up. It was all an accident really, the adventures just grew and grew. As a child I spent lots of time on the lakes in Canada with my grandparents and I learned to love the outdoors. While I thrive on adventures, I also like a relaxing holiday every now and then. My wife and I have been to Antigua, the Seychelles and Mauritius, so I can do luxury, I just happen to prefer the excitement of Papua New Guinea or Antarctica. It was in the Kawartha region of Ontario in Canada where my grandfather had built a wooden cottage on the shores of Lake Chemong. I loved those endless summers. I will never forget the time my father took my best friend Toby and I on a canoeing/camping holiday to Algonquin national park. We camped and caught our own fish. Portaged the cedar Canadian canoe from lake to lake and came across bear. moose and beavers. It was incredible. You are going for a Year of Adventure with your latest TV series. Do you ever long for a Year of Staying home. Where/what is home? Sometimes. I have two young children, Ludo who is two years old and a daughter Iona, who is just six months. I miss them terribly when I am away, but I also love my job. I love pushing my boundaries and testing myself physically and mentally. Home is West London, Notting Hill Gate to be exact. It offers the complete antithesis to my worldly adventures and I love it. What is it about the Anaconda Adventure Race National Series in Australia that particularly appeals to you? I love the diversity of adventure races. I was never very sporty at school, so I have had to work hard to get myself up to fitness in my 30s. I have taken part in endurance races all over the world and I love the mix of people all pushing their own personal boundaries. The Anaconda race is in a beautiful location and you can't ask for much more than that for motivation when you're flagging. In upmarket travel we've seen a rise in people paying a lot of money for a real adventure -where do you think this need comes from/ is it growing? People are time poor and they want an intense experience in a short amount of time. Many people are chained to their office desk for weeks on end and are looking for a motivation to keep fit. Adventures offer a powerful hit. A week can feel like months. It gives them plenty to talk about with their friends. Normal holiday tales just don't cut it anymore. people want to hear about adventure and excitement. You learn to value the small things in life and get to see how precious life is... it is about life and defining who you are and where you are going. You've crossed the Sahara desert, rowed the Atlantic Ocean in 49 days and raced to the South Pole. What has all this isolation taught you about life, love ...and all that? Or is it just about sore feet and aching limbs? Where do I begin. it has taught me so much about life. you learn to appreciate what you have. You learn to value the small things in life and get to see how precious life is. It is so much more than blisters and sore feet, it is about life and defining who you are and where you are going. Every adventure or challenge I do makes me a different person. You learn about yourself and those around you. You learn not to become complacent in life and to value those close to you. Family becomes everything. That's a tough one to answer. Rowing the Atlantic was a massive challenge but probably the scariest thing I have ever had to do was diving with Nile crocodiles in the Okavango Delta of Botswana. I scuba dived without any protection or cage with wild crocs over 4 m long. It was so unbelievably scary but probably one of the most rewarding experiences of my life. You have two young children - do you want them to grow up to be accountants or follow in your footsteps? In some ways I'd like them to have a nice sensible job without danger, but on the other hand I hope they are adventurous, not in the endurance kind of way, but generally in life. I hope they will explore the world and get to see the many faces of planet earth. Where do you go on holiday with the family? The family are still young so we don't travel too far. We spend our summers in Austria which is where my wife's family are from. We also go to Portugal and Dubai where we also have family. I can't wait for the children to get a little older so that we can start exploring more. You've led ordinary people on extraordinary adventures - what is your own most extreme dream? That was a tough series. I led more than 20 expeditions all around the world. Probably one of the hardest was to the Mountains of the moon in Uganda. We had to cross the world's biggest bog. It was muddy, cold and tough going. Name three completely un-adventurous things you love to do. Drink fine wine, preferably a new world Sauvignon Blanc, go for a walk in Hyde park in London with a flat white, the children, my wife and the dogs (two labs), and dinner in front of the tele.